This article is part of a series on qosfc.com profiling Dumfries born ex Scotland full internationalists. Related articles as part of that series are Billy Houliston, Bobby Ancell Dominic Matteo and Willie McNaught. As well as Jamie McAllister we were spoken to by a second player from Saturday’s Preston North End v Bristol City encounter. Introduced as a sub at 2-0 down half way through the second half, Barry Nicholson had the satisfaction of a decent result from his stint at the coalface; he left the pitch with a 2-2 draw at the final whistle. Perhaps not too surprisingly, he was a man who didn’t find smiles difficult to come by when he spoke with us after the game. Interestingly for an interviewee, he followed up the introductions by asking the first question of the discussion. “I’m led to believe, compliments of the club historian, there are five people from Dumfries to have played for Scotland. Of course you’re one of the five, your first game was Poland away in 2001? “Yeah, I got drafted in late, I was at Dunfermline at the time and I was through in Dunfermline staying at the time. I think it was a Sunday night waiting to go into training on the Monday morning. I got a phone call late on the Sunday night to say that I’d been drafted into the squad and to meet up on the Monday morning with the Scotland squad. So I had to drive back to Glasgow and to make sure I had all my boots and stuff. I quickly met up with them at Firhill, trained on the Monday morning, and flew out on the Monday afternoon / Monday night”. "The third game was against Sweden in 2004." 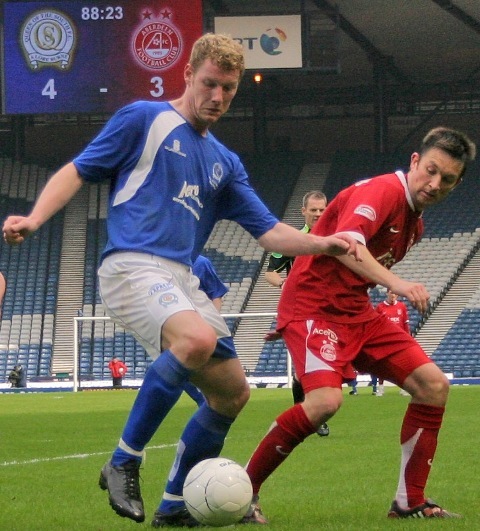 At Nicholson’s time around the squad there was another player from Dumfries. “A look alike?” asked Nicholson clearly with some uncertainty. “Ahu?” followed by silence from Nicholson, still none the wiser. “I take it he’s a news reporter?” asked the curious Nicholson.